Some traditional collars have a buckle to remain closed under any circumstances but cats can be in a lot of danger from this. If they get stuck in a peg or a tree branch or other things then there is a serious risk of choking. It is impossible to remove any element in the house (or even more so if you have a garden) that can lead to such an incident and they happen more often than you might think so choosing a collar that doesn’t have this problem is the best choice. These are really cheap and made of elastic materials to permit the cat to escape if they push against the collar’s strength. Wriggling the head leads to the cat expanding its size and then they can land back on the ground safely. 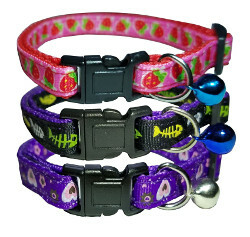 These might be lost quite often so you might have to buy more than one (that is why they are so cheap) but if the cat gets lost and in that moment loses the collar as well then the chances of getting your furry friend back will be very low. Another option is a breakaway collar that will open when you apply sufficient pressure such as the cat’s own body weight in case they get hung in a peg by accident. These will be a bit more expensive but are sure to keep your cat safe. The problem again is that if the collar is lost when your cat is in an unknown place then it will be a challenge to find your pet. If you consider this to be a real risk (and you should if you live in a crowded city) then there are small implants that will allow you to track your cat at all times. Ask your vet for more information about these. Once you decided on the model there is still the matter of getting the right size for the cat and to do this you should measure the cat’s neck girth after which you add an inch or so to that so that they will feel comfortable with it around their neck. There are many brands and colors available so you can still make the cat look prettier and at the same time ensure a higher degree of safety for them so there is no reason to ignore a safety collar!